Right alongside our front walk sits a cluster of flowers that I planted from seed to assist with hummingbird photography – I’d rather have shots at natural-looking flowers than feeders. Unable to find either plants or seed for varieties I knew were hummingbird attractors, I grabbed a bag of “bird and butterfly mix,” which wasn’t an ideal choice – absolutely nothing that has grown has been of the faintest interest to the hummers. But a couple of days ago I noticed something strange about one of the flowers I passed constantly: it had stray petals showing up in the central pollination area, which eventually struck me as “not right.” Stopping to take a closer look, I induced some movement from this cluster. Ah. 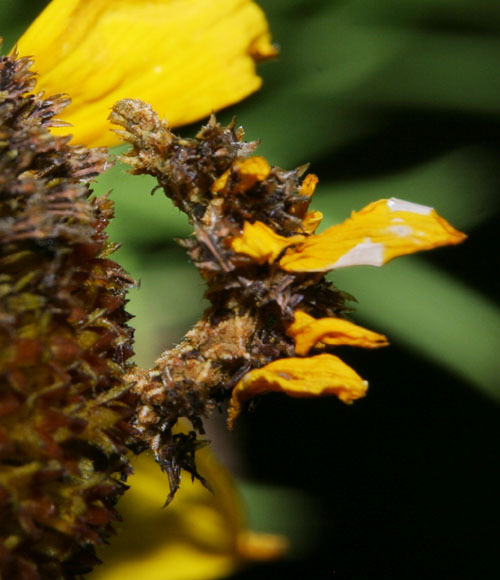 Seen here, a curious species of inchworm has decorated itself with cuttings from the flower, allowing it to sit in an area that couldn’t be more noticeable and eat peacefully. The camouflage was so good it took several minutes to actually determine what kind of insect I was even seeing, and as you look close at this image, realize that the paler portions are the inchworm’s own skin – everything else is planted on. Most times the worm kept its head buried down into the flowers, and it took several minutes to get this shot as it changed position. Inchworms are actually larval stages of butterflies and moths, and initial research indicates that this is most likely a wavy-lined emerald moth (Synchlora aerata) larva, since it appears to be the only species of Synchlora known to do this. You might compare this behavior to the spider crab that I featured earlier. I took these photos at night, which was both a blessing and a curse. A curse, because the wind had kicked up and all of the plants were swaying unpredictably, making even focusing hard. A blessing, in that the temperature had dropped significantly, so not only was I no longer sweating like a sumo, I wasn’t in danger of sunburn. Plus, there’s a lot more activity at night. I have gotten to know not only several species of insect, but individuals as well. A spotted orbweaver spider (Neoscona crucifera) lives in a tight nook under the porch overhang by day, to emerge at dusk and recreate her circular web every evening, recycling the material by eating it each morning before she retreats into hiding for the day; I have to remember where she likes to be each night so I don’t walk through the web. Two large female praying mantises used to occupy the pampas grass in the yard, until one lost the territorial battle to the other – I found this out while the loser was half-eaten by the victor (I knew some, only some, species did this as mating behavior, but not as rivalry.) I see the winner every couple of days, and know that an egg sac is imminent. I’ll have to watch for it when I cut back the pampas grass in the winter, since if I have the species right, the egg sac will overwinter and hatch new young out in the spring. Anyway, those dark eyes presumably help with night vision, otherwise why should there be any change? 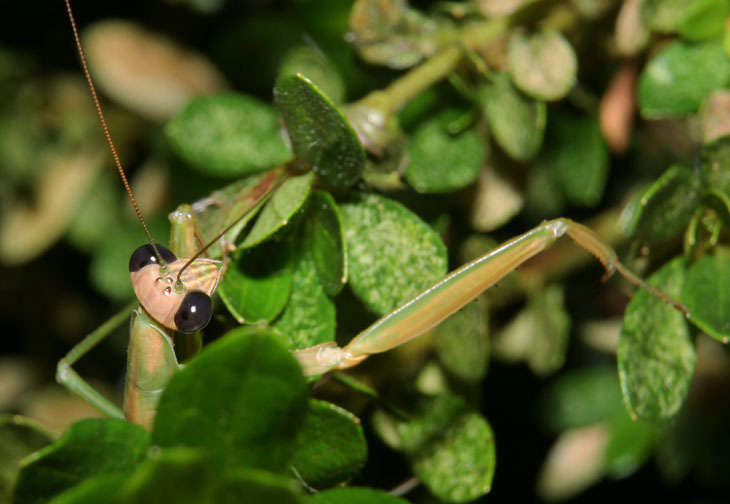 But what change is actually taking place isn’t clear, though there are some indications that the reduction in pigmentation allows more light to come into the eyes obliquely, making mantis vision less precise but more effective in terms of light-detection. The same source of this info also threw out another curiosity: while I thought that the mantids would be hunting more at night, since that’s when I see both them and prey species active the most, this may not be the case, and night activity is strictly sexual. I’m not sure about this, since they may have only meant the particular species under study, and my photo subject here seemed to be exhibiting stalking behavior. This tied in with the visual resolution that was related in the paper as well: most insects with compound eyes seem able to see only one “spot” from each facet (actually a rudimentary eye in itself,) and create an impression of their surroundings from this collection of spots. This isn’t all that different from us, where we have a collection of spots from each photoreceptor cell in our eyes, but we can focus, while insects have no way to perform this function. So what they respond to are changes in individual spots, making movement and shadows the primary way of spotting prey and danger. Since my night vision isn’t all that hot itself, I was relying on a flashlight, which threw shadows with every move – my photo subject here was displaying some quick, precise movements which put me in mind of chasing down prey, though I was seeing nothing to capture myself. This may have been because he was seeing the shifting shadows and misinterpreting them. I encountered one more known resident last night. 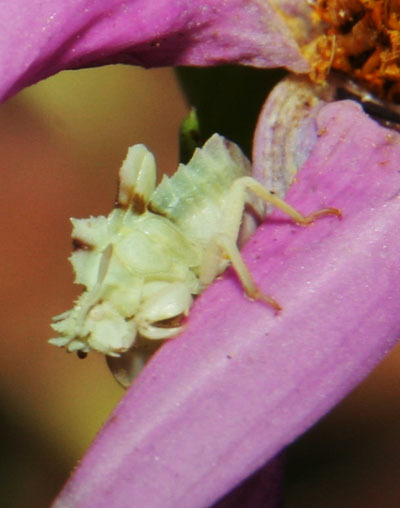 If you remember the ambush bug from a few weeks back, this is a continuation of that story. Later visits turned up a second one nearby, while the flowers were all dying off, so I collected the new one and transplanted it to this flower patch which was much more active. Initially, I placed it on the same flowers as the inchworm, but it abandoned my choice within the day to reappear two days later on the same species it had occupied when I found it (I stand corrected!) Then it had disappeared for a while, only to be spotted again last night. It stands out like a sore thumb against the petals and flower center, but blends in quite well with the base where it likes to spend its time during the day, so I’m surmising this is primarily a night hunter as well. All of these, and several other insect photos from last night, were collected in an area smaller than a bedroom, one of the reasons I pursue so much macro work. I barely have to step outside to see a wide variety of both species and activity, and now know several well enough to recognize them on sight, and learn some behavioral traits from them at the same time. None of this requires any special travel, blinds, or even preparations to observe, and everything seen here was spotted on decorative plant species in groomed areas of the yard. It’s a safari right under our noses. So if you have kids that keep bringing home bugs to show you, introduce them instead to the art of observing in place, as well as web research on what they’ve found – you think I knew any bit of this when I got the photos? Hell, no – I’m not educated in the slightest. But I feel obligated to find out, especially when I’m showing them off to you, so it means that I keep expanding my store of knowledge just because I keep looking for interesting photo subjects. Don’t discourage this in your kids, and in fact, get them a journal to keep observation notes (I think I just found another post subject.) It’s a behavior well worth fostering. Here is a site than has a long list of flowers and plants that attract hummingbirds: http://www.hummingbirds.net/attract.html. I have often seen hummingbird feeding at the flowers on the pole beans in my vegetable garden.